Garry Small Saab is located in Portland, Oregon. We are a family owned and operated that have been in business since 1986. We have full Sales, Service and Parts departments with a very knowledgeable staff to assist you. Our philosophy has always been to focus on the long-term relationships with our customers. Our sales staff is always ready to help you get into a vehicle that suits you best - all in a consultative, no-pressure, no hassle environment. When it comes time for service, our factory-trained technicians are ready to service or repair your Saab as needed, with all of the factory special tools, latest publications and bulletins on hand. Our service staff employs the same philosophy as our sales staff when it comes to assisting and advising customers on their vehicle's service and repair needs. And if you like to do some repairs yourself, our parts department has a very large inventory of Saab parts on hand, so you are sure to find the parts you need to keep your Saab running properly. Also, with a large inventory of parts, we can keep the down-time to a minimum if your Saab is in for service or repairs. At Garry Small Saab we specialize in Saab, so we know the product well. We all have a passion for Saab. In fact, we like the product so well that most of our employees drive Saabs... some even own more than one! 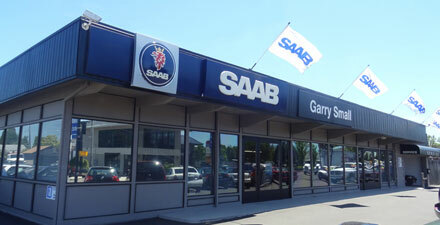 We welcome you to stop by and experience the Garry Small Saab difference!